Conscious Governance consultants, Conscious Leadership facilitators and Prosperity Consciousness mentors. They have worked with some of the largest companies in the world. 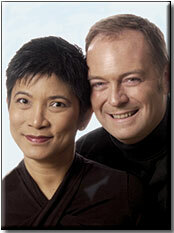 They are managing directors and co-founders of LifeMastery in Australia. and have worked globally with presidents, CEOs, and senior leaders to bring about dramatic organizational improvements in the fields of health, trade, employment, finance, sports, telecommunications, religion, higher education and philanthropy as well as in nonprofit and community organizations. Chutisa and Steven are also the authors of Conscious Leadership: The Key to Unlocking Success and Leading Yourself to Money with Consciousness. Steven Bowman’s previous executive roles include national executive director of the Australasian Institute of Banking and Finance, CEO of the Finance and Treasury Association, general manager of ExpoHire, assistant director of the Australian Society of CPAs, and director of the American College of Health Care Administrators. He is past president of the Australian Society of Association Executives and has held numerous other board positions. Chutisa Bowman’s previous executive roles include senior executive at a number of Australia’s largest publicly listed retail corporations (David Jones, Coles Myers -Target and K Mart), and a senior consultant with one of Australia’s most prominent usability and human factors specialist consulting firms. She has worked extensively with organization such as Telstra, Australia Post, ANZ Bank, CSIRO, Authentic8, Mercantile Mutual, and the Department of Education, Employment and Training. Conscious leaders are those who are charismatic, are able to make powerful and successful decisions that defy logic, are innovative in the ways they address issues, have a major impact on the expansiveness of their organization and the people affected by the organization. To become a conscious leader, business executives require integration of both executive management skills and conscious leadership abilities with their potency and power. Through discussion, case studies and group participation, Chutisa and Steve will facilitate business executives and leaders to cultivate the essence of conscious leadership – “Healing, Caring, Nurturing, Creativity, Joyfulness, Fun, Expansiveness and Intensity of Infiniteness” that will allow the innate conscious leadership qualities and abilities to come forth. They will facilitate expansion of awareness so that leaders may see the self-imposed limitations, truths and lies in what they do, be, have, create, and generate. They will also facilitate leaders to shift any part of their reality that isn't working. To provide the framework, tools, inspiration and transformational processes that people can use to cultivate a beingness of conscious leadership. •	How to apply the philosophy of consciousness to your current work experience to create an extraordinary life and business.